Ladies of Lucid – Snow Bunny event! Hi! I introduced Ladies of Lucid last year, and got a positive response. That event is back now, with the theme of Snow Bunny. It started today, ends February 11, and I’m only showing some of the items here. Ladies of Lucid is a collaboration of items from all of the designers on the Lucid Sim, which would follow a particular theme. There are no items more than 50L! You can find all of the featured items below here. There’s clothing and also prefabs. Both items of clothing also come in pink. As for the prefabs, this home from Buttons is 51 prims! I think it’s good for any season. And also, we have a skybox from A.D.D. Andel. It is 83 prims with everything rezzed, but you also have the option to rez just the skybox, snow, trees, and planters. There’s also a demo! Meila Solo did a fab job covering some (and more) of the stuff that I didn’t cover so check out her post too! 69L sale on ALL skins @ Mango, Mango! For today only (January 19, 2011) all skins in all tones are priced only 69L each @ Mango, Mango! First, I wanted to show a mini sampling of the makeups available (there’s way more than shown here, and even very bold ones at that!). Also there’s a mini hunt around the store too. Find five mangoes around the store, which are priced to 1L each. These mangoes include tattoo makeups and a skin in pale tone (not shown). All makeups are worn with the Naked skin in Dark. I’m only showing some of them below. Pink Outfitters 50L sweater sale! Pink Outfitters, one of my favorite stores on the grid, is having a sweater sale on select sweaters until January 4. 2011. All colors of these sweaters are marked down to 50L, the newest sweater is called the Taylor Sweater, which also has a gift holiday version in the subscribo until tomorrow. I’m wearing all of the sweaters below. Aren’t they cute? All of the sweaters can be found on the 2nd floor by the way. Ladies of Lucid – 50L or less new event! Today, I wanted to introduce you all to a new event called Ladies of Lucid. It is a collaboration of items from all of the designers on the Lucid Sim, which would follow a particular theme. There are dollarbies and cheapies, but generally, there are no items more than 50L! The current theme is Boudoir, and would always take place here. This collection would be available for two weeks (from Dec 3- 17th). There are many different items available, like poses, jewelry, furniture, hair, etc. I just wanted to show off some items in this post. By the way, Sydd Sinister did an awesome job covering some of the other items that I did not cover in this post so check out her post as well! -Screen, Lounge, and Rug: buttons. 50% off closing sale @ Demina Design! Demina Design is having a closing sale until November 22nd, and everything is 50% off! You can find various items such as t-shirts, sweaters, tanks and more. You can also find very cute socks, and shorts (which happen to be one of my favorites in sl) here, along with shapes that are 350L each. Aside from the shapes, the price range is from 10L-200L (for fatpacks). By the way, the prims for all clothing is no copy/no mod/trans so these can also be used as great gifts! Feel free to check out the owner’s Flickr set here to see most of the great items for sale! 50% off sale @ Barcode! 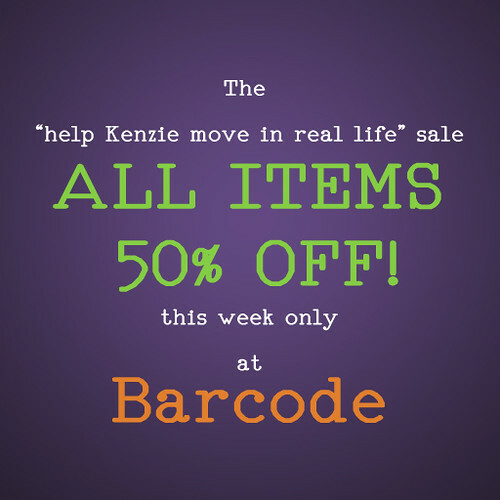 Makenzie wants to move in RL, and needs your help so she is having a sale! For this week only, everything is 50% off @ Barcode! You can find most kinds of furniture, a skybox and also cute houses, and the price range is from as low as 10L(! )-600L(for furniture sets, usually).